"IF DX WINS WE RIOT"
It was hard not to get caught up in the frenzy that followed Shawn Michaels' recent return to Monday Night Raw. There was a rare buzz in the air as he verbally sparred with one of his greatest rivals, inadvertently doing far more to sell his own possible return than the laboured main event of the upcoming Super Show-Down card in Australia. On that night, between 60,000 and 80,000 will likely pop themselves silly experiencing the magic of seeing Triple H and The Undertaker for the very first time...until the bell rings. 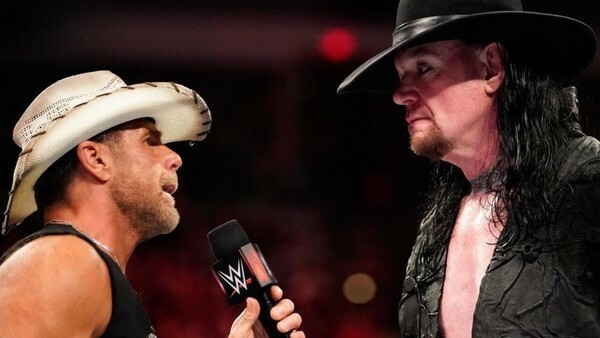 Little from either over the past few years suggests 'The Game' and 'The Deadman' have it in them to deliver a match remotely as exhilarating as their iconic entrances. Even at their respective peaks, they mostly resided in the tier below the elite anyway. Triple H vacationed in 'HBK's air-space in 2000, but his briefly-phenomenal topline run ended up in worse shape than his own quadriceps when he returned from the devastating injury in 2002 looking twice the size and half the wrestler. The Undertaker was a late-bloomer in many respects, unexpectedly shining with Edge, Batista and others during a mid-00s renaissance few predicted following his 'Big Evil' nadir. For all they still have about them - and in WWE lore, they have much - neither of them collectively keep what 'The Heartbreak Kid' harnesses alone. Even in 2018, even with his dated Dad patter and even with a haircut he rightfully keeps hidden under a hat, he's still 'The Main Event'. Still the 'Icon'. Still the 'Showstopper'. Over 20 years after his arguable apex as a performer, and it all still feels believable because it once so was. Michaels was a total f*cking riot.